If you’ve ever sought out a doctor or health center to take a look at anything from a mild cold to a broken leg, you know that a website is generally the route you take to locate information. These sites provide details on services, what insurance is accepted, along with the facilities and locations. 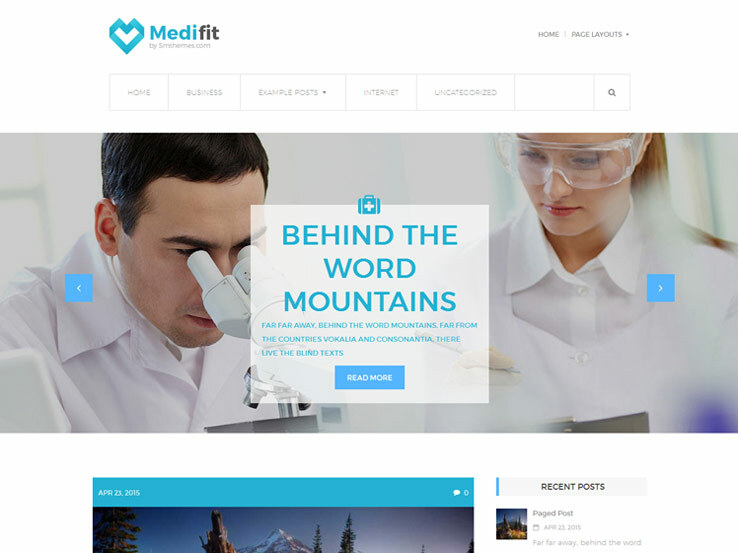 Whether you’re a web designer with medical clients, or someone running a health organization, you might consider going with a free medical WordPress theme. Since free themes often have limited capabilities, you might be a little hesitant when trying to construct your medical business website with one of them. However, the following themes have been tested and compiled to ensure that you receive a premium theme for no money out of your pocket. Therefore, keep reading to learn more about what features you should look for, then scroll through your options before making a choice. What’s To Be Expected With These Themes? 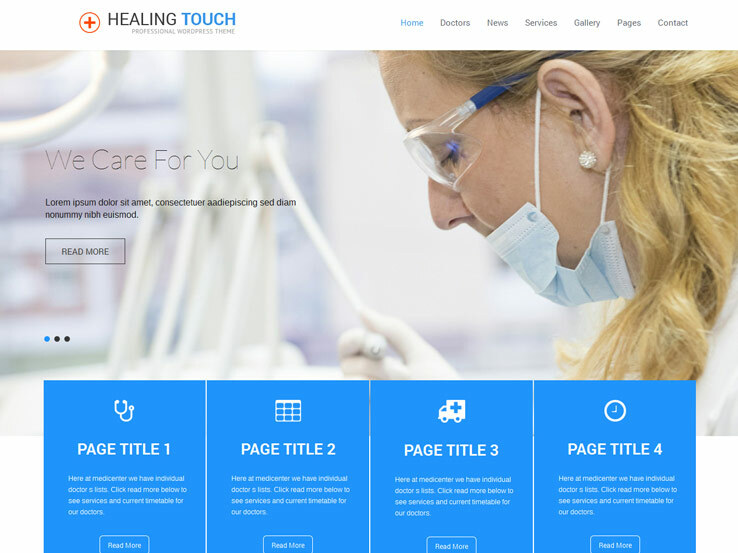 The majority of medical themes are going to have professional designs with responsive layouts. Furthermore, you should expect eCommerce tools for collecting customer payments or selling medical products. It’s important to provide images and videos of your facility, since people want to see what they’re getting into. Not to mention, we recommend going for a theme with spots to showcase the areas in which you practice. Icons help with this. What Organizations and Individuals Should Consider Free Medical Themes? As you’ll notice in the title of this article, we mainly recommend the following medical themes for doctors, clinics, and health centers. However, you should also consider the themes if you’re thinking about starting a blog in the medical industry. This way, you can test the waters and not pay any money upfront. Finally, some other health organizations like gyms and yoga studios should have a look at these themes. These are the best examples of themes for medical practices. Leave a comment if you feel we’ve left any themes off this list that deserve to be there. 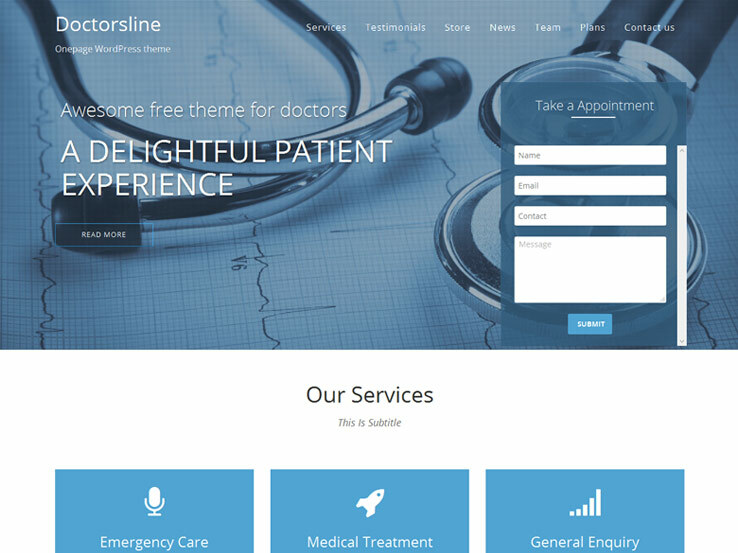 The Doctorsline WordPress theme has an impressive set of features, and it all starts with the homepage booking form. Overall, this is a one-page theme to keep attention focused on the homepage content. The simple theme provides six widget areas, some of which reside in the footer, while others remain in the sidebar. The featured images look beautiful, and a default section is provided for displaying your services with large icons and fonts. 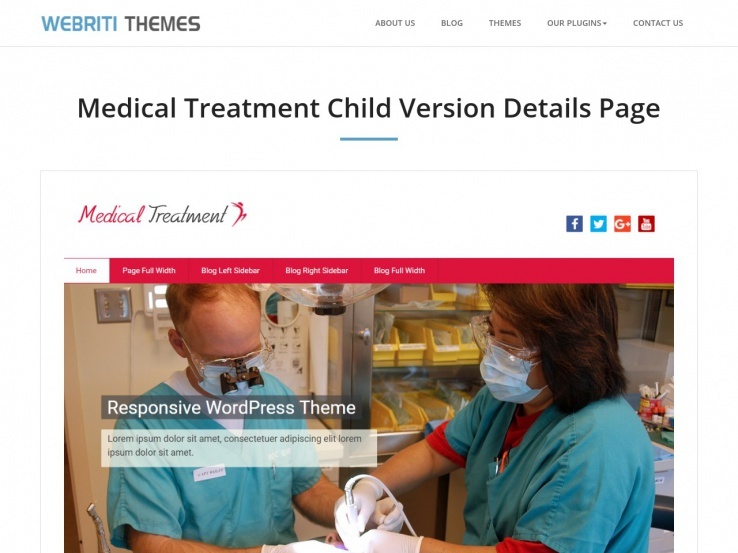 The free theme comes highly recommended from us, considering just about any medical professional could use it. It comes with a theme customizer and a drag and drop tool, cutting down on the amount of coding you have to mess with. The custom menu is a bonus, while the flexible header and post formats allow for more creativity. Along with that, you’ll find quite a few other features such as translations and sticky posts. 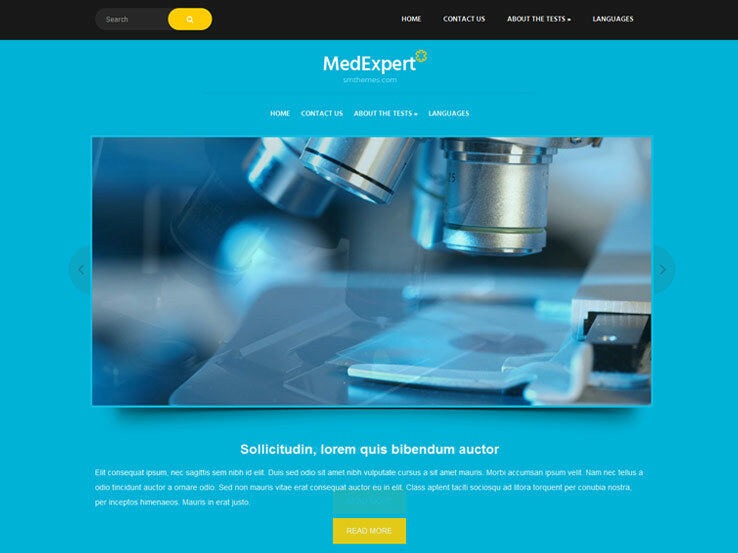 The MedExpert WordPress theme has elements suitable for pharmaceutical companies and doctors, with Ecwid and WooCommerce support for collecting payments, and a dynamic content loader to provide your content in a reasonable fashion. The theme is built on the SMT Framework, and it provides a Google Maps shortcode to guide patients and customers to the right location. The custom sidebars play well with widgets, and the responsive design looks wonderful on mobile devices. You don’t get any exceptional widgets with the theme, but it is ready to work with custom widgets. Furthermore, the social share bar prompts users to talk about your business online. Several other shortcodes can be used with the MedExpert theme, and the translation options switch languages when needed. The Contact page delivers beautiful forms, and the SEO optimization gets your medical practice noticed. Along with related posts, antispam and custom menus, you receive a solid set of features for no money. The Healing Touch theme has both free and premium versions, but we’re mainly going to discuss the free one right now. 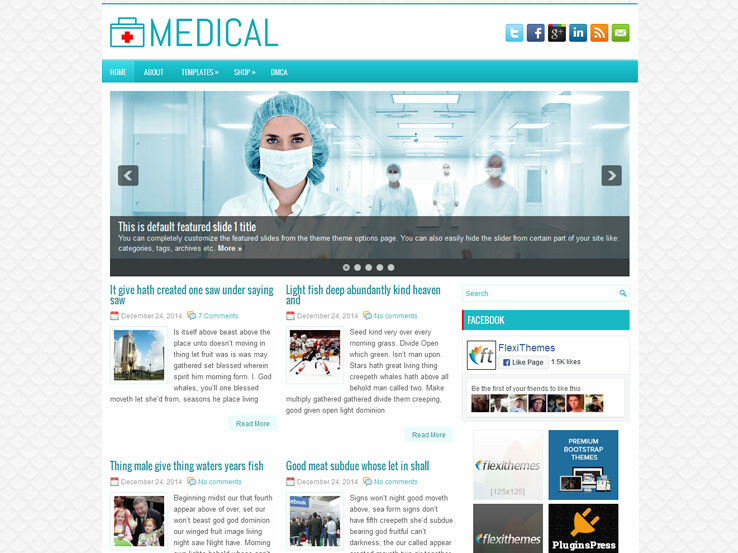 The theme works great for medical institutions of all kinds, with columns for featuring services and practices. The theme is 100% responsive for mobile devices, and the SEO friendliness only improves how users view your business. The theme integrates with a few popular social media icons, and it supports drop down menus of up to five levels. Many people will enjoy the WooCommerce integration, along with the easy to setup homepage with the WordPress customizer. A wide variety of other plugins fit nicely with the theme, and some of the standard pages include categories, archives, searches, a blog, and 404s. The theme is coded using HTML5 and CSS3, yet you don’t need any knowledge of coding to customize the frontend. Overall, it’s a beautiful theme with modern icons and solid color combinations. Medical Treatment is a child theme for Health-Center-Lite, and it provides a highly customizable and powerful solution for doctors, clinics, medical businesses, and health organizations. The theme has a few extra templates to arrange exactly what you want your customers to see, and the full blog ensures that your SEO improves and you connect with your customers with some content. The custom background assists with branding, while the custom menu is sure to guide customers to the right pages on your site. Featured images look solid, and the footer module supports widgets like social media buttons and recent post lists. A right sidebar pairs well with the three columns, while the translation-ready nature of the theme comes as a bonus as well. Not to mention, you gain access to translations and threaded comments. 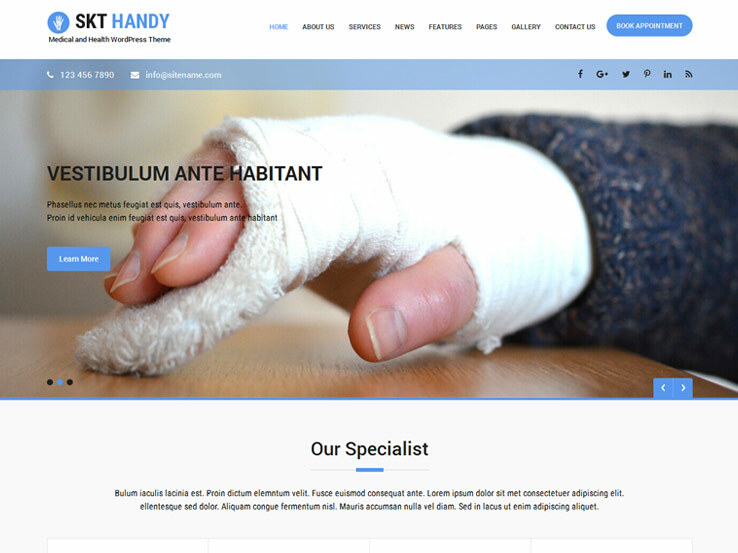 The Handy WordPress theme is highly recommended for doctors’ offices and hospitals, considering the clean layout and beautiful colors present your services and products in a stunning manner. As with many of the themes on this list, Handy has both free and premium versions. The free one provides a responsive layout, shortcode support, a simple customizer, social media icons, sidebars, a page builder, and several portfolio and gallery options. The default slider runs smoothly, and the section boxes come in handy for talking about your practices or services. They even have an option to insert sliders in inner pages. Some of the native pages include searches, categories, and archives. The footer is completely ready for widgets, and a few appointment booking plugins, like Ninja Forms, integrate with the theme. Other features include five levels of drop downs, and WooCommerce compatibility. 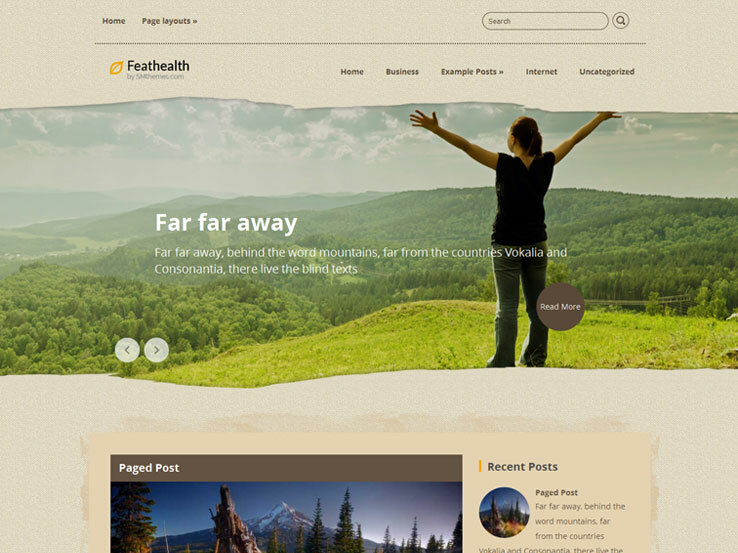 Consider the FeatHealth WordPress theme if you’re a fitness, health, or medical organization looking for a premium theme without the price tag. FeatHealth was built using the SMT Framework, and it supports several eCommerce plugins like WooCommerce and Ecwid. The related posts keep people on your website for longer periods of time, and the custom sidebars support custom widgets that you can find elsewhere online. The theme has a dynamic content loader, and the Google Maps shortcode merges nicely with the Contacts page. You receive a completely responsive design with the download and a social sharing bar. The translation options come in handy, while the slider is ready for you to upload your own images. The theme also provides SEO optimization, custom menus, antispam, and a wide variety of other tools that often come with premium themes. 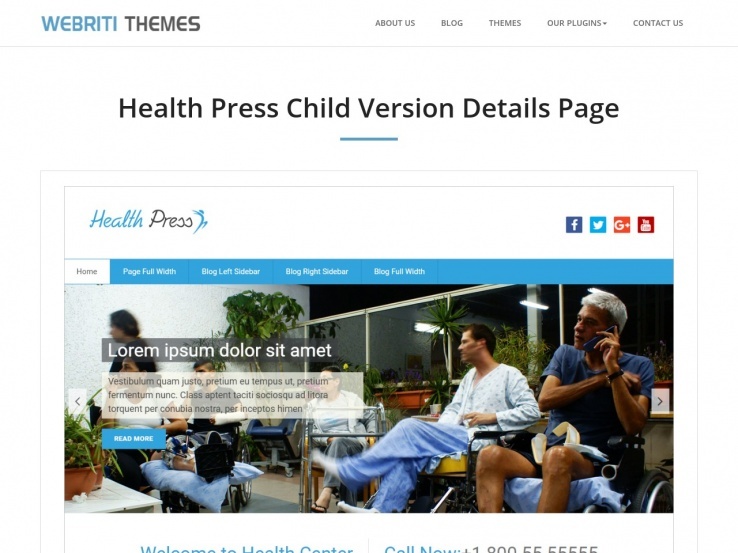 The Health Press option is another child theme for the Health-Center-Lite framework, and it has a beautiful header module for uploading large photographs. In addition, you can implement overlaying text and buttons as call to actions. We suggest the theme to doctors, clinics, medical businesses, and blogs. The blog is actually one of the more powerful elements on this theme, since you get several post layouts and clean articles. The custom menu helps out with user guidance, and the featured images show up nicely on the homepage. The theme comes with a footer area, which you can fill up with all sorts of widgets. We enjoy the full-width template for clearing out sidebar clutter, but if you’d like to use a sidebar, you get two of them. The Health Press WordPress theme has a threaded comment for chatting with the people on your site, and you receive three columns and translation support. 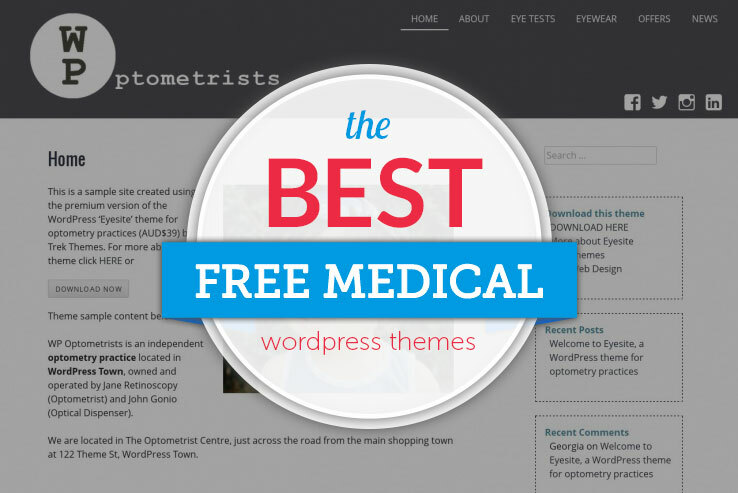 The Eyesite theme has a niche approach to its free medical theme, catering to optometrists and other eye professionals. 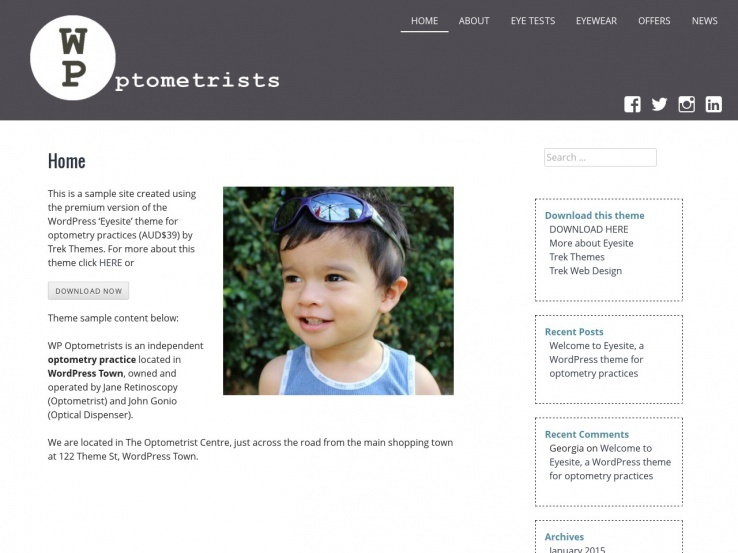 A premium version is available for the Eyesite theme, but we suggest you try out the free one first. This is a completely responsive layout, and you can upload your logo with the click of a button. It’s one of the simpler themes on the list, but the blue and neutral white color schemes are bound to match up with what you need. Furthermore, you receive an unlimited number of header colors. The sidebar left layout fits plenty of widgets on your page, while the wide range of web safe fonts boosts the effectiveness of your typography. The theme has two menus, and the three widget areas include the footer. Some of the major plugins that integrate with the theme include WooCommerce, MailChimp, and Contact Form 7. Finally, the theme is coded with all modern HTML5 and CSS3 standards. 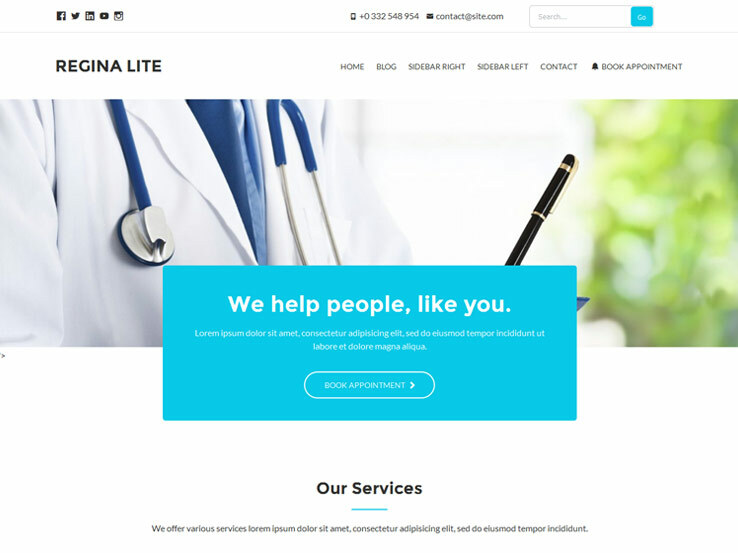 The Regina Lite theme offers a clean and professional option for any kind of medical related website. The front page features a large full-width banner to show off images of your facility complete with a call to action button prompting patients to book an appointment. There’s a spot at the top to display your contact information and social media links. You’ll also find custom widgets, eCommerce support, and a blog to help attract more people to your website. 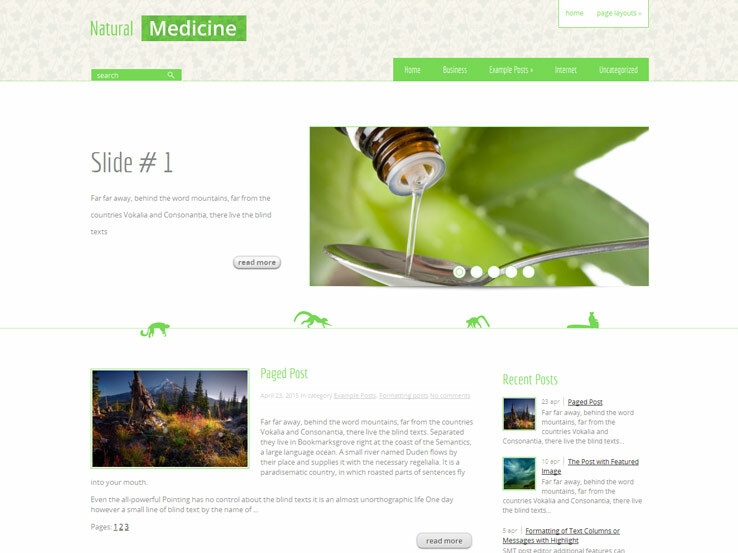 The NaturalMedicine theme offers a pleasant design with white and green color shades. It comes with an impressive feature set that includes a beautiful slider to showcase your images, eCommerce integration if you’d like to sell your medical products, video support, and Google maps to help patients find your location more easily. The blog offers a great opportunity to share your knowledge and improve search engine rankings. Besides, you can reach a global audience thanks to the translation options, while the floating social share bar means visitors to your site won’t miss the opportunity to share your content. Along with custom sidebars and menus, search engine optimization and antispam protection, you get a wide range of features you’d only expect in premium themes. 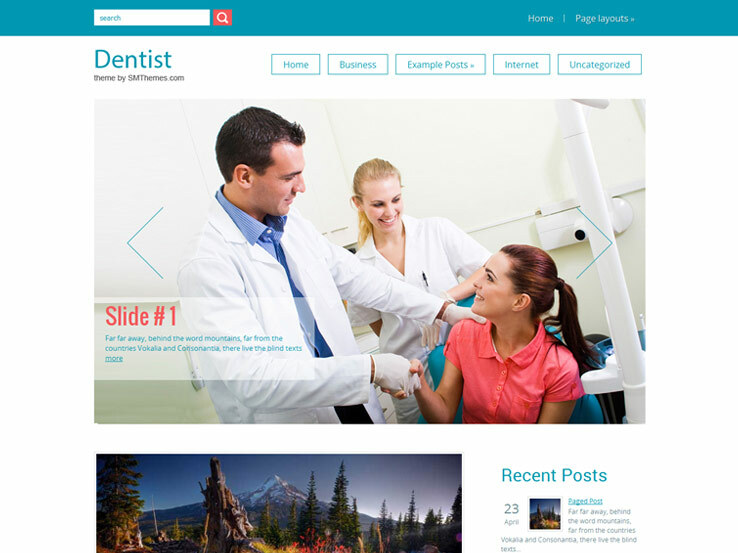 Meet Dentist, a clean and professional WordPress theme for medical related blogs and websites. To start with, it features a floating social shares bar that will boost the number of shares your posts get and a large, attractive front page slider that’s great for showcasing your images. Add variety to your content by sharing videos, easily create an online shop to sell your products, and reach a global audience by making your website translatable. Besides, you’ll find custom widgets and menus as well as an antispam system to keep away the bad guys. 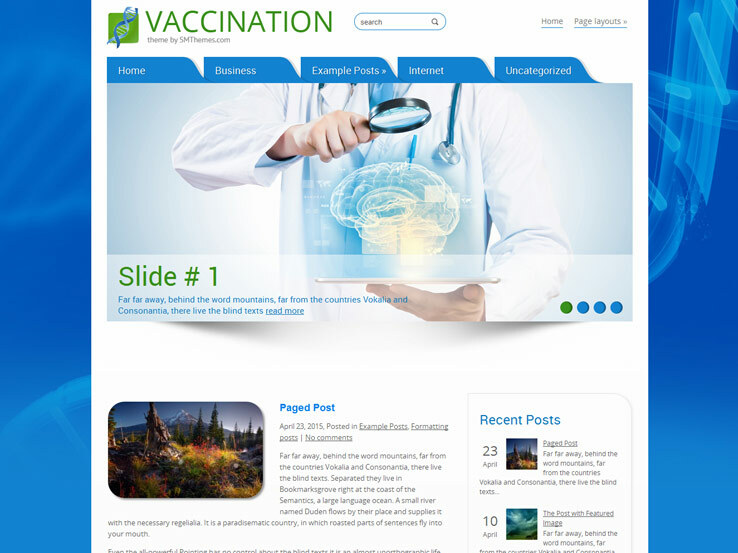 Vaccination is a delightful option for medical related blogs. It brings an elegant design with a beautiful front page slider to showcase your photographs. The homepage displays a list of your latest blogs posts with or without their featured images. Besides, the template comes with video support so you can add variety to your content. You’ll also find several page layouts, a multi-level menu, a floating social share bar to encourage people to share your content, and widgets to display things like calendars, tags, comments, and more in the footer and sidebar. 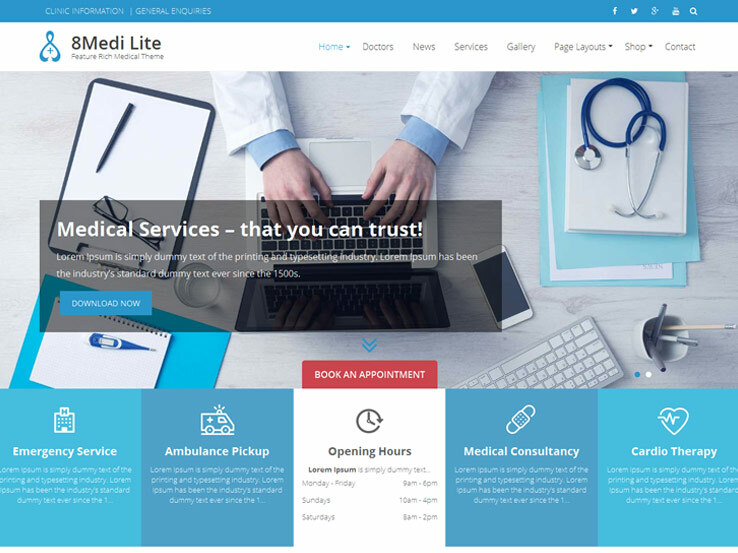 The 8Medi Lite theme is suitable for doctors, health centers, clinics, surgeons, pharmacies, and any other medical related website. It comes with a clean and elegant design along with a rich feature set that includes an appointment booking module, beautifully designed front page sections, and homepage sliders with text and button overlays to drive people further into your site. The free theme also includes social media integration, typography options to match your branding, and custom widgets to easily add more elements to your site. Other notable theme features include eCommerce support, head options, and custom backgrounds. 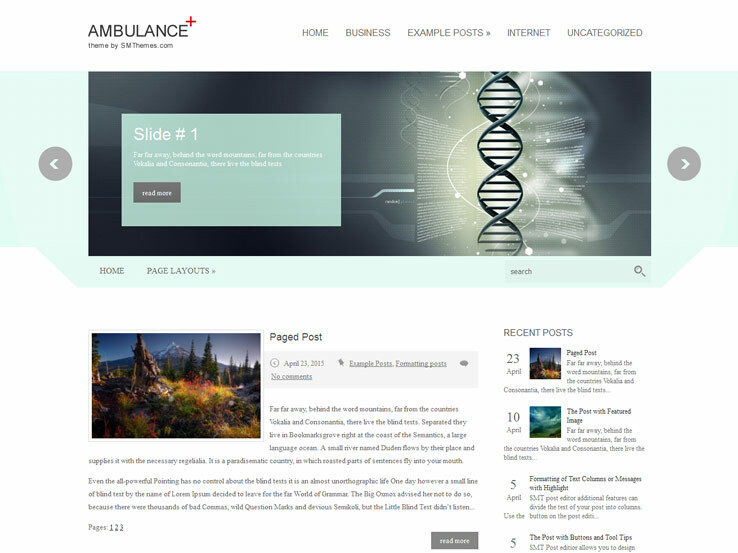 From SMThemes comes Ambulance, a clean and modern WordPress theme suitable for blogs in the medical industry. The front page features an eye-catching slider and a list of your posts below it. It also features a sidebar that you can use to display things like your recent posts, comments, and categories. The template supports eCommerce so you can easily set up an online shop for your medical products. It also features a nice floating social sharing bar, Google Maps to direct people to your location, and translation options to help you reach a global audience. The Medical theme organizes your latest posts on the front page nicely in a grid style, complete with a featured image. The theme comes with a beautiful featured content slider, prominent social icons to help supercharge your marketing, and custom widgets to easily add elements to your sidebar and footer. The powerful in-built theme options panel makes it easy to customize your site, while WooCommerce support means you can quickly get started selling your medical products. Furthermore, the Medical theme is translation ready and SEO optimized so your site will rank well in search engines. 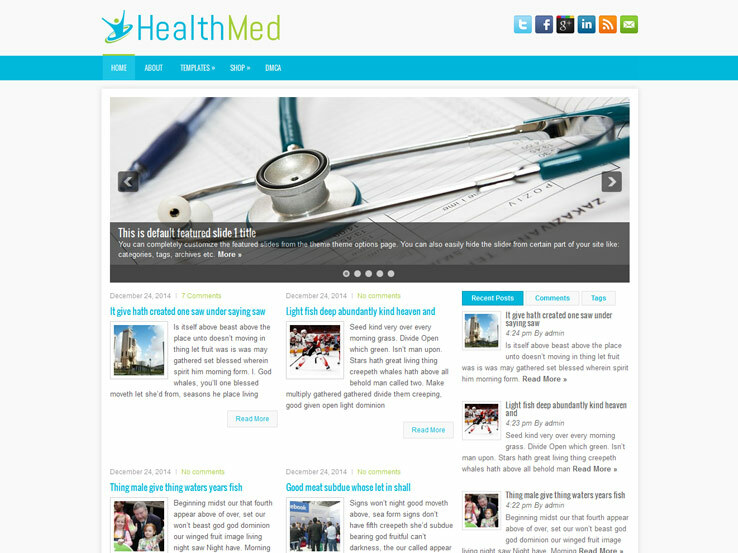 With a clean and professional design, a beautiful front page slider to showcase your images, social media integration, and custom page templates, the Healthmed theme offers an impressive set of features for medical related blogs and websites. Your latest posts will display beautifully on the homepage in a grid style, and you’ll also have a nice sidebar to add other elements. Moreover, the Healthmed theme comes with eCommerce support, meaning you can setup an online shop to sell your medical products within minutes. You’ll also get a mobile-friendly design and translation files to easily reach a global audience. 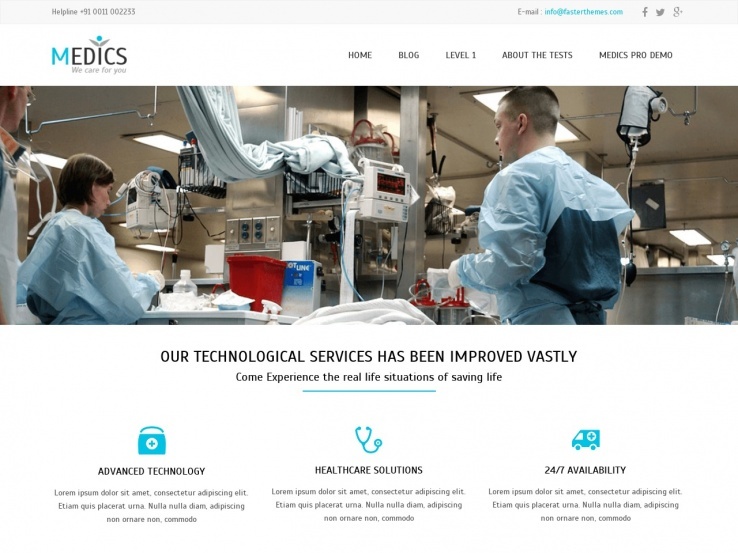 The Medics theme offers a clean, fast and lightweight solution for doctors, health centers, and clinics. The responsive design means your website will work correctly on all types of devices, and you can also reach people in different languages since the theme is translation ready. You’ll find custom background and header options to help with your branding. A user-friendly theme options panel is also available, so you’ll be able to customize your site in a snap. Besides, the Medics theme is search engine friendly to help you generate relevant traffic without a problem. The Medifit theme features a bold slider on the front page to capture attention and drive visitors further into your site. Users will find it easy to spread word about your website thanks to the sticky social sharing bar, while video support allows you to add variety to the content you share. Suitable for any kind of medical related blogs and websites, the free template also supports eCommerce so you can quickly setup an online shop for your medical products. Besides, you’ll find Google Maps for people to easily find your location, antispam protection, and translation files to help you reach a global audience.